The most soulful group in the disco era was formed by Earl Young and his partners Ron baker and Norman Harris. In 1971 Neil Bogart signed the group to Buddah Records. Their first release was a sanppy revival of Judy Garland’s 40’s tune “Zing Went the Strings of My Heart”. It was their first chart single, reaching number 17 pm tje R&B list in 1972. Between the years 1972 and 1975 they moved from buddah records to Philadelphia International. and then setlled at Atlantic Records. While at Atlantic Records they had several releases the first “That’s Where the Happy People Go” earned them several Billboard awards in 1976, which also included a Best Disco Drummer for Earl Young. ​The next album”Disco Inferno” gave them a gold album and single. They received a Grammy for the soundtrack “Saturday Night Fever”. The single climbed to the number 11 on Billboards top 100 charts. Their next release was “Trammps III”, Best of the Trammps”, “Slippin Out”, and “Mixin it Up”. Today the group consists of Earl Young, Antwon Young, Lorenzo Rankins, and Johnny King. in recent years they appeared on the “Oprah Winfry Show”, “Ricki Lake Show”, “VH1”, and etc. The group has a reputation for being boisterous and jubileant with their harmonies and sound. They rock the audiences around the world. 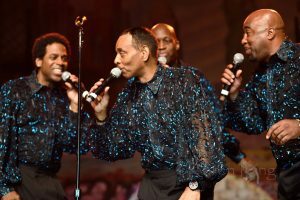 They have performed as such venues as the Greek theatre, Madison Square Garden, Casinos in Atlantic City, Las Vegas, Foxwoods and Mohegan Sun. The group is at its best during private functions such as the Carol M baldwin Breast Cancer Foundation. When The Trammps featuring Earl Young are performing every show is a party and they will surely burn it down.